Each player places one more agent of his color near the round 5 space of the rounds track, and places the round score marker of his color on the 0 space of the scoring track. Place 3 victory point (VP) tokens on each space of the rounds track. Each player also takes the building control markers of his color. Shuffle the stack of building tiles, draw 3 and place them faceup in each of the 3 spaces in Builder's Hall. Place the remaining tiles facedown in a stack on the labeled space near the Hall. Sort the adventurer cubes - Clerics (white), Fighters (orange), Rogues (black), and Wizards (purple) - and place them within easy reach of all players, along with the gold tokens (in denominations of 1 and 5). During the game, if there aren't enough of a particular adventurer type in the supply to hire, you can hire only as many as are available. Shuffle the Lord cards and deal one facedown to each player. Keep your card secret from your opponents. Shuffle the Quest cards and deal 2 cards faceup to each player as their active quests. 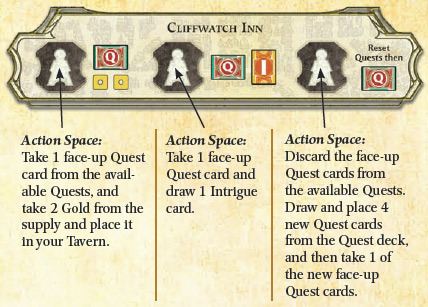 Place one faceup Quest card in each of the 4 spaces of Cliffwatch Inn. Place the remaining cards in a facedown Quest deck on the labeled space near the Inn. Shuffle the Intrigue cards and deal 2 cards facedown to each player. Keep your cards hidden from your opponents. Place the remaining cards in a facedown Intrigue deck on the labeled space near Waterdeep Harbor. The player who has most recently been to another city takes the first player marker and goes first. The starting player gets 4 gold, the player to his left gets 5 gold, the player to his left gets 6 gold, and so on until all players have received starting gold. Store gold on the Tavern on your player mat. Whenever a player must draw from an empty deck, shuffle all the cards in the respective discard pile to form a new deck and place them facedown in the appropriate board space. Do not shuffle any completed Quest cards back into the Quest deck. 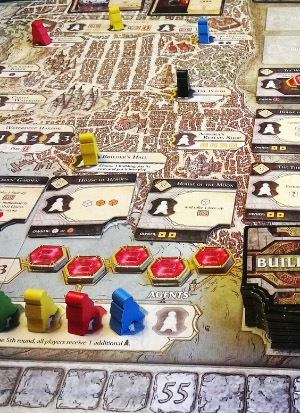 As a Lord of Waterdeep, you assign your Agents to further your interests in the city. There are 5 different colors of these wooden pieces, which represent various secret societies. Each player chooses a color and takes Agents of that color. These form your pool of Agents. Place them on the "Agent Pool" area of your player mat. The number of Agents in your pool depends on the number of players, as shown in the table below. Each player also places 1 more Agent of his or her color near the Round 5 space of the rounds track. That Agent will be available for use on that round. A sixth (gray) space is included for use in future expansions. In addition, the game contains 2 neutral Agent pieces: the Ambassador and the Lieutenant. These Agents do not begin play under anyone's control but can be added to a player's pool through game effects. Each player takes a player mat that matches his or her Agents' color. This helps keep track of various game resources. Agent Pool: Here is where you keep Agents that you have not yet assigned. At the end of the round, all of your assigned Agents return to your pool. 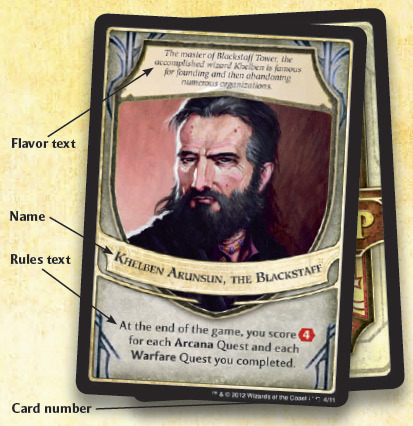 Completed Quests: Whenever you complete a Quest, you place its card in the "Completed Quests" area of your player mat. Your Agents hire various Adventurers, whether noble heroes or mere mercenaries, to accomplish various tasks. There are four kinds of Adventurers, represented by wooden cubes: Clerics (white), Fighters (orange), Rogues (black), and Wizards (purple). Different Quests require different kinds of Adventurers to complete. Along with Gold (see below), these cubes form the supply. Place them to the side of the game board, within easy reach of all players. The game board contains 9 basic Buildings, each of which has one or more action spaces to which Agents can be assigned. There are also spaces for Building tiles, which players can purchase and put into play. To start the game, draw 3 Building tiles and place them face up in each of the 3 spaces in Builder's Hall. The remaining face-down Building tiles form a stack, placed in the labeled space on the game board near Builder's Hall. Each Building, whether printed on the game board or a tile in Builder's Hall, contains the same kinds of information. Name: You can look up more detailed information about the Building by finding its name. Cost: The amount of Gold needed to purchase the Building. For example, Helmstar Warehouse costs 3 Gold. 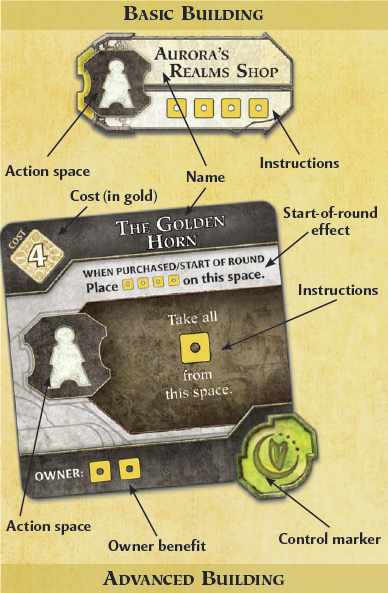 Instructions: The resources that Building provides, which might be Adventurers, Gold, Victory Points, card draws, or other things. For example, Helmstar Warehouse provides 2 Rogues and 2 Gold. Owner: The player who purchased the Building gains the stated benefit when any other player assigns an Agent to that Building (1 Rogue, in the case of Helmstar Warehouse). Cards represent the tasks that Adventurers perform in your service, your sneaky manipulations, and secret victory conditions. 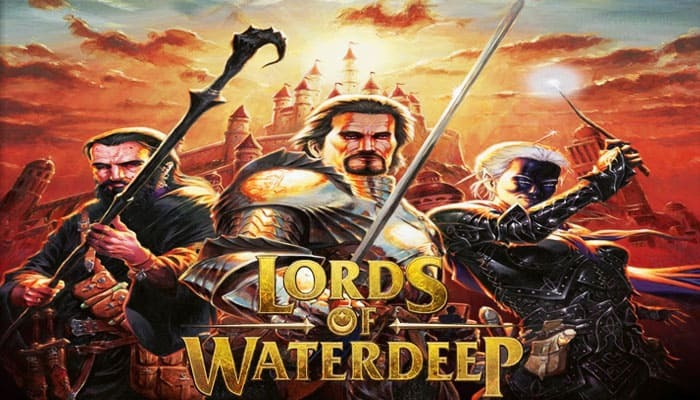 The city of Waterdeep is secretly administered by powerful individuals known as the Lords of Waterdeep. 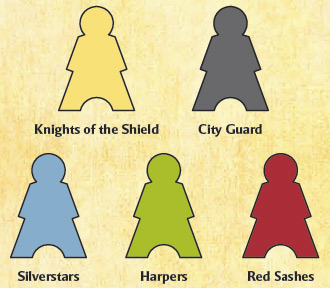 Eleven Lord of Waterdeep cards ("Lord cards" for short) represent these hidden personalities. Shuffle the Lord cards and deal 1 card face down to each player. Keep this card face down-your identity is a secret to your opponents. Return the remaining Lord cards to the box, face down. They won't be used for the rest of the game. Whenever a player must draw a card from an empty deck, shuffle all the cards in the respective discard pile to form a new deck and place them face down in the appropriate space of the game board. Do not shuffle any completed Quest cards back into the Quest deck. Each Lord card grants bonus VP for meeting certain conditions, as have received starting Gold. described in its rules text. For example, Khelben Arunsun grants bonus VP for completing Arcana Quests and Warfare Quests. 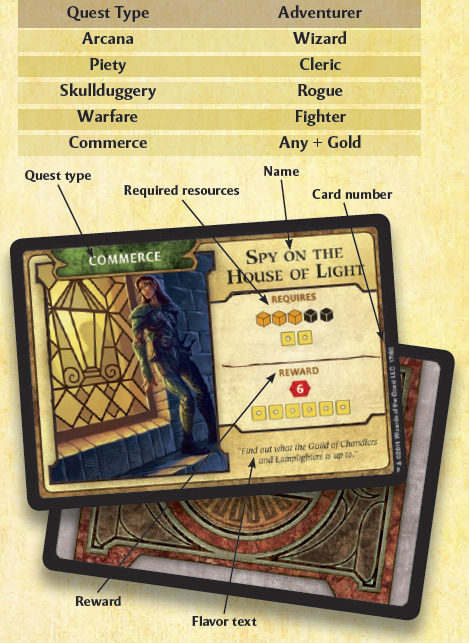 As a Lord of Waterdeep, you advance your interests by completing Quests, represented by Quest cards. Shuffle the Quest cards and deal 2 cards face up to each player. These cards form each player's active Quests. Next, place 1 face-up Quest card in each of the 4 spaces of Cliffwatch Inn. The rest of the face-down Quest cards form the Quest deck. Place the deck in the labeled space on the game board near Cliffwatch Inn. Intrigue cards let you secretly manipulate others to advance your ends. But be careful-your fellow Lords of Waterdeep are also skilled in intrigue! Shuffle the Intrigue cards and deal 2 cards face down to each player. Keep these cards hidden from your opponents. The rest of the face-down Intrigue cards form the Intrigue deck. Place the deck in the labeled space on the game board near Waterdeep Harbor. 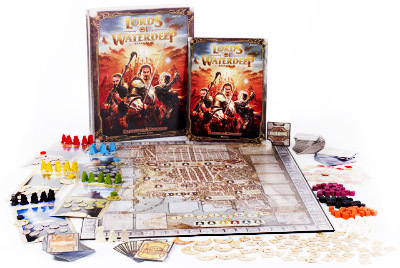 The Lords of Waterdeep game is played in eight rounds. The player with the most Victory Points at the end of the final round is the winner. The Lords of Waterdeep game is played in rounds. During each round, players take turns in which they assign their Agents to various tasks. The rounds track on the game board starts out with 3 VP tokens on each round space, as shown in the setup instructions. The VP tokens also serve to mark which round it is. At the start of each round, remove the 3 VP tokens from that round's space and place 1 VP token on each face-up Building in Builder's Hall. When Purchased/Start of Round: Some Building tiles have special instructions to be followed when the Building is purchased and at the start of each round. If any of those Buildings are in play, follow the start-of-round instructions for each. Once all start-of-round effects are complete, players take turns in order. Start of Round 5: Each player takes the extra Agent piece of his or her color from the space near the rounds track and adds it to his or her pool. The extra Agent is available for the rest of the game. Each player takes turns, one at a time, starting with the player who has the First Player marker and proceeding to that player's left. During your turn, if you have Agents available to assign, you take one or both of the following actions. If you have any Agents in your pool, you assign 1 of them. To assign an Agent, place it on any unoccupied action space of a Building, whether a basic Building or one that has been put into play. You cannot place an Agent on an action space that contains another Agent (yours or another player's) or on Buildings that are not yet in play. When you assign an Agent, follow the instructions for that action space. You take that action just once. You cannot choose to pass your turn. If you have Agents available, you must assign 1 of them. (In the unlikely event that you cannot take an action on your turn, you must pass). If you have no more Agents available to assign, you can no longer take turns that round. For the rest of the round, play skips to the next player in order who still has available Agents. Several basic Buildings have special rules, as described here. For detailed descriptions of all Buildings' effects. 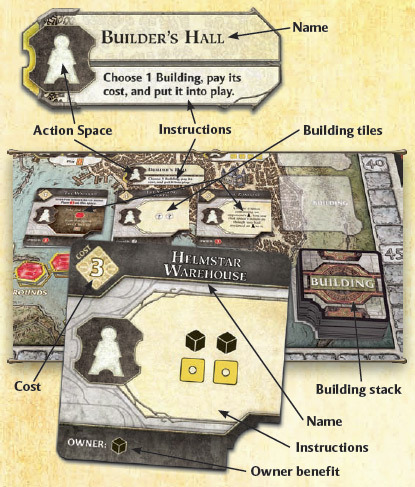 Builder's Hall allows you to purchase Building tiles, which add new potential actions to the game. Whenever you assign an Agent to Builder's Hall, choose one of the face-up Buildings available for purchase and pay its Gold cost. You immediately score any VP for that Building and place its tile in one of the open spots on the board. Place one of your control markers on that tile to show you are the owner. After you purchase a Building, immediately draw the top tile of the Building stack and place it face-up on the vacated space. Owner Benefit: Once a new Building is in play, it is available for anyone to assign an Agent to, just like any other Building on the game board. However, when someone other than the owner assigns an Agent to that Building's action space, the owner gains the benefit described in the tile's "Owner" line. Cliffwatch Inn has three action spaces instead of the usual one. You can assign more than 1 of your Agents to Cliffwatch Inn if it still has an open action space (but you still can't assign more than 1 Agent per turn). Acquiring Quests: At the start of the game, this Building contains 4 face-up Quest cards. Assigning an Agent to Cliffwatch Inn is the usual way to get new Quests. However, each action space has a different effect. You can choose any of the available action spaces when you assign an Agent to Cliffwatch Inn. Whenever you take a face-up Quest card, immediately replace it with a new card from the Quest deck. 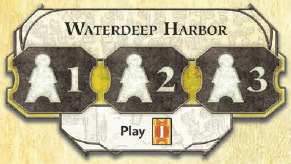 Waterdeep Harbor has three action spaces instead of the usual one. You can assign more than 1 of your Agents to Waterdeep Harbor if it still has an open action space (but you still can't assign more than 1 Agent per turn).Assigning an Agent to one of those spaces has two effects. 1. Play Intrigue Card: By assigning an Agent to one of the action spaces on Waterdeep Harbor, you play a single Intrigue card from your hand. If you have no Intrigue cards, you cannot assign an Agent to Waterdeep Harbor. When you play an Intrigue card, you follow its instructions immediately. Its effect takes place just once. 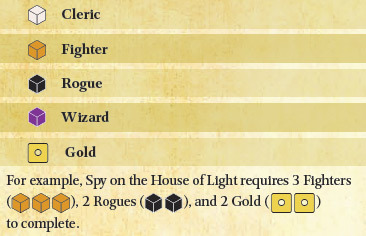 For example, Lack of Faith forces each opponent to remove 1 Cleric ( ) from his or her Tavern if possible. If an opponent has more than 1 Cleric, you cannot force that player to remove additional Clerics with this card. 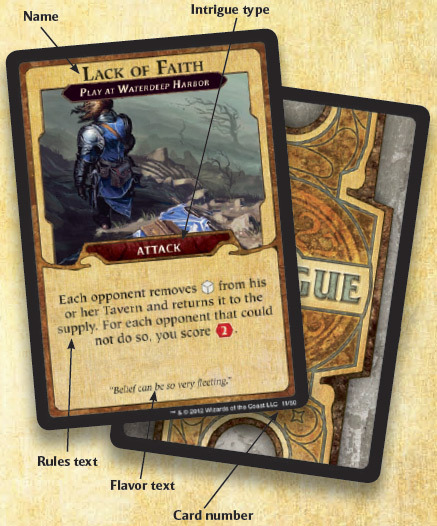 Attack: Attack cards hinder or penalize opponents, often helping you in the process. For example, Lack of Faith is an attack that removes another player's Cleric. Utility: These cards do something beneficial. For example, Call in a Favor lets you take resources of your choice from the supply. 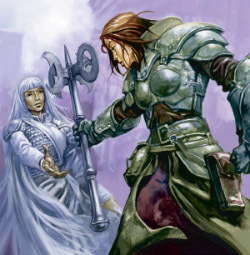 Mandatory Quest: You can force an opponent to undertake a minor but pressing task before finishing other Quests. 2. Reassign Agent: After all Agents have been assigned in the round, each player with an Agent in Waterdeep Harbor reassigns that Agent to another action space. In effect, that player takes an additional turn with that Agent. Players reassign Agents in order, starting with the action space numbered "1". You cannot reassign an Agent to Waterdeep Harbor. Some game effects also allow players to reassign Agents during play. After assigning an Agent, you may complete one Quest. Each Quest card specifies how many and what kind of Adventurers are needed to complete it. Often you need to spend Gold as well. You don't have to complete a Quest if you don't want to. You cannot complete more than one Quest on your turn. To complete a Quest, remove the required Adventurers and Gold from your Tavern. Return those tokens to the supply. Then collect the specified reward. Regardless of how many Agents you assign or reassign on your turn, you can complete only one Quest that turn. Quest Type: There are five different types of Quests: Arcana, Commerce, Piety, Skullduggery, and Warfare. A Quest's type provides an idea of what sort of Adventurers are most important to completing it. 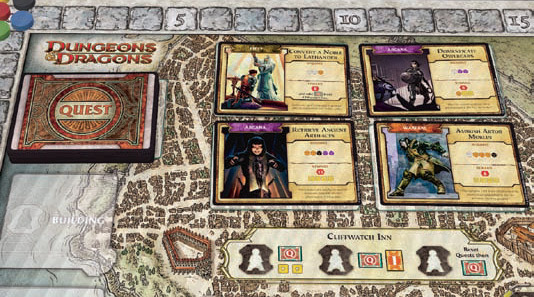 Different Lords of Waterdeep score bonus VP for completing Quests of particular types. For example, Khelben Arunsun scores 4 bonus VP for each Arcana Quest and each Warfare Quest that player completes. Requires: Each Quest card requires certain resources (Adventurers and Gold) to complete, shown on the "Requires" line by symbols. Reward: A completed Quest provides a reward to the player who completes it, shown on the "Reward" line. Rewards usually include VP and might include other things, such as Adventurers, Gold, or cards. If a reward includes Adventurers or Gold, take the appropriate pieces from the supply and place them in your Tavern. For example, Spy on the House of Light grants a reward of 6 VP and 6 Gold. You immediately collect the Gold and advance your score marker 6 spaces along the scoring track as soon as you complete the Quest. Quests provide a reward just once, when you complete them. After you collect the reward, turn the Quest card face down and place it on the "Completed Quests" area of your player mat. Some Intrigue cards are Mandatory Quests, which you play on opponents to hinder their plans. When you play an Intrigue card with a Mandatory Quest, choose an opponent and place the card face up in front of that player. That player cannot complete any other Quests until he or she has completed the Mandatory Quest. 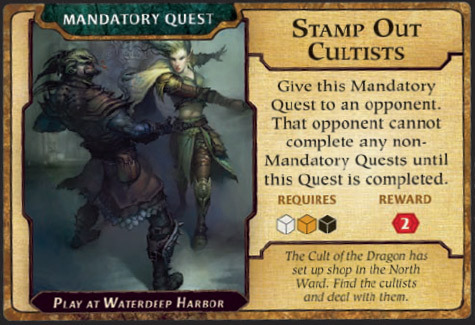 For example, Stamp Out Cultists requires 1 Cleric, 1 Fighter, and 1 Rogue to complete and provides a reward of 2 VP. When a Mandatory Quest is completed, place the card in the Intrigue discard pile. 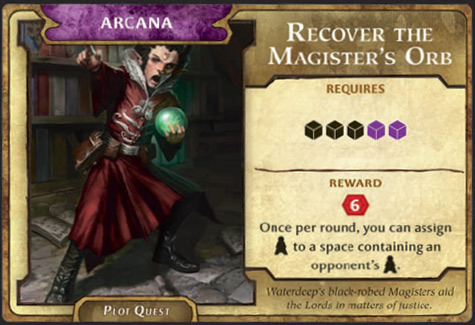 A few Quests have the notation "Plot Quest", which indicates that they are especially important to successfully managing Waterdeep. Plot Quests have ongoing effects in addition to providing rewards. For example, Recover the Magister's Orb has a one-time reward of 6 VP. However, it also grants an ongoing effect: Once per round, you can assign 1 Agent to a space containing an opponent's Agent. You can quickly identify a Plot Quest by looking at the name on its card. The name of a Plot Quest is a different color from those of ordinary Quest cards. When you complete a Plot Quest, place its card face up near your player mat to remind you of the ongoing effect. When all Agents at Waterdeep Harbor have been reassigned, the round ends. At the end of the round, all players return all their Agents to their pools. The player with the First Player marker begins the next round. The game ends after 8 rounds of play. At the end of the eighth round, perform final scoring for each player. Each player counts up VP and advances his or her scoring marker accordingly. The player with the most VP after final scoring is the winner. In the event of a tie, the player with the most Gold wins.